The Resonants perform at least one event each year where the proceeds are donated to a local or national charity of the group's choice. Sometimes the group is invited by charitable organisations to participate in their program. Each year, The Resonants participate in the organ and tissue Donate Life ACT Service of Remembrance and Thanksgiving Service at Old Parliament House. 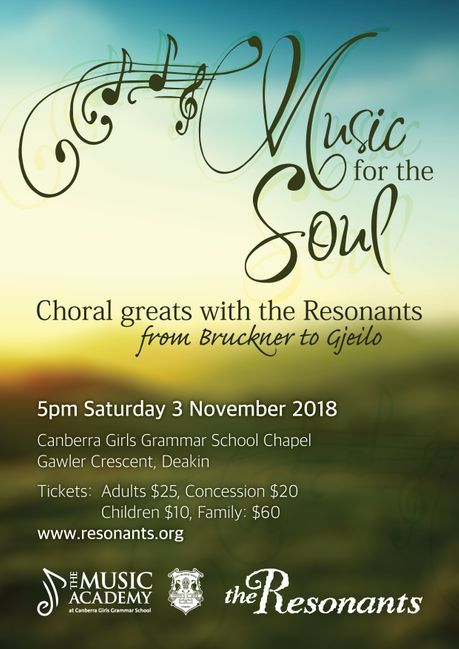 To date, the choir has raised funds for Lifeline ACT, Louise Rowen (Tumut community), Australian Red Cross Asian Quake and Tsunami Appeal, Galilee Inc, Bushfire Appeal Concert, Calvary Hospital, Red Cross, Heart Foundation, St Vincent de Paul, Smith Family, and Cyclops a local charity supporting kids who are carers.